Day 3 - Canapés - stuffed dates wrapped in bacon. Today I am buying all the ingredients for my show stopping canapés. They are unashamedly stolen from Duck and Waffle restaurant in Heron Tower. First choice is to go and eat them their whilst gazing out across London …second choice…make you’re own. Easiest thing ever - taste delicious! Combine linguiça, cream cheese and manchego in a bowl and mix well to create filling. Butterfly dates length-wise and ‘stuff’ with linguiça filling. 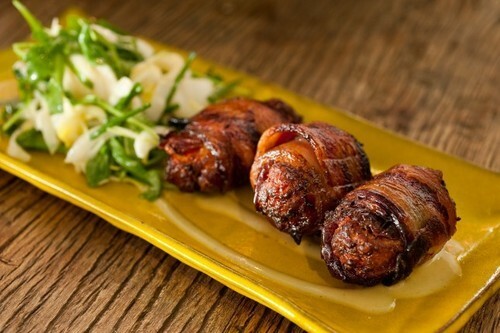 Close dates and wrap snugly with bacon. Fry at 350 degrees until golden brown. Finish in the oven if needed. What’s your favourite canapé creation?